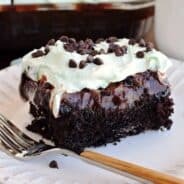 Starting with a cake mix, these Gooey Chocolate cake bars are filled with cream cheese, cocoa and topped with a delicious, creamy Chocolate Frosting. In my effort to get my house ready and packed for our big move this summer, I’m working my way through my pantry. I don’t use cake mixes very often, but I always keep them on hand. Sometimes I just crave “cake soup.” It’s a thing. And it’s delicious. Last week I stumbled across a box of Devil’s Food Cake mix, it practically jumped out of my pantry, screaming, MAKE ME YOU FOOL. Okay, so I have a wicked imagination, but if that were the case, you can understand why I indeed had to use this cake mix. Immediately. A few years back I made this gooey chocolate cake. I dusted it in powdered sugar, took a really bad photo (which I thought was great at the time, my how my photography has changed). And I shared this with all of you. My original intention was to just remake the recipe and update the photos. But then my sweet tooth screamed “FROST ME YOU FOOL.” That happened. I’m sure of it. 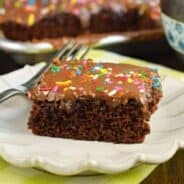 And because I always listen to my sweet tooth, I made a rich chocolate frosting, using my favorite Rodelle Baking Cocoa and slathered these cake bars with loads of creamy frosting. And if that wasn’t enough, I topped that with some chocolate sprinkles and mini chocolate chips. This is like QUADRUPLE chocolate bars. They are intensely rich. But insanely delicious! I originally cut these into 24 bars. Then realized how rich they were and cut those bars each in half! 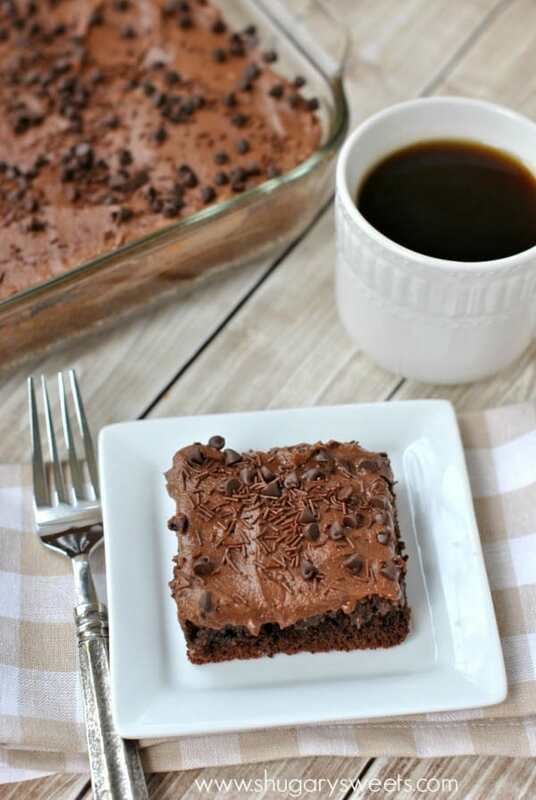 By pressing the first layer down into a crust, they resemble brownies and you don’t NEED a fork. However, the gooey center layer, filled with cream cheese, will make you sigh as you sink your teeth into these bars. And the frosting? I have no more words. 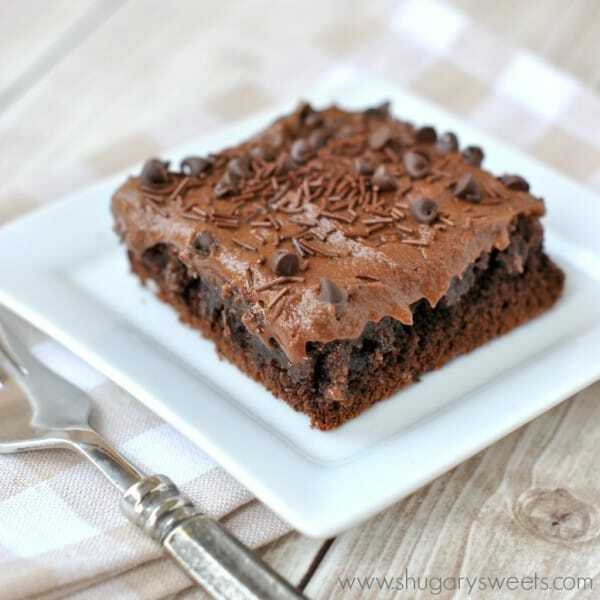 You just need to trust me that these are good and need to be made ASAP. Like right now, what are you waiting for??? Preheat oven to 350 degrees. Spray a 13x9 baking dish with baking spray (I use Baker's Joy or Pam for baking). Set aside. In a mixing bowl, beat cake mix with egg and melted butter. The mixture will be thick and crumbly. Dump into the baking dish and press into the bottom of the pan (using finger tips or bottom of a cup to press evenly). In same mixing bowl, beat cream cheese with powdered sugar, eggs, melted butter, cocoa and vanilla. Beat for about 2-3 minutes until creamy and fully combined (scrape down edges of bowl occasionally). Pour over first layer in baking dish, spreading evenly. Bake for 35-40 minutes. Remove from oven and cool completely before frosting. For the frosting, beat butter with powdered sugar, vanilla, cocoa and milk for 3-5 minutes until fluffy. Spread over cooled cake. Add sprinkles and chocolate chips if desired. Store covered in refrigerator for up to one week. ENJOY. Obsessed with Chocolate? I completely understand…. 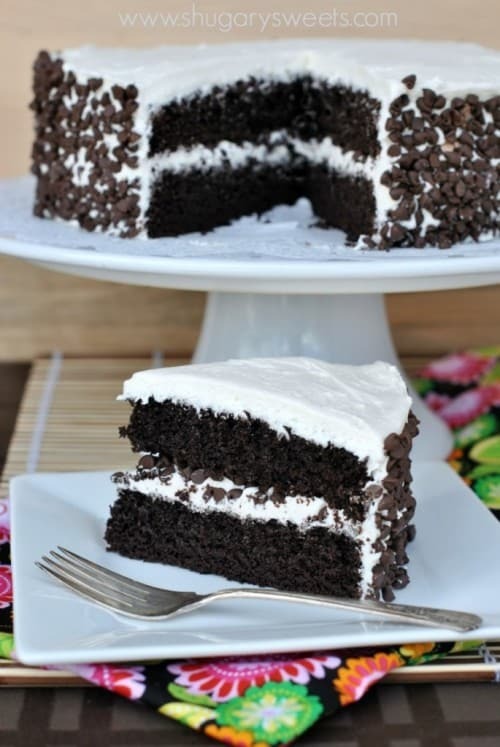 Dark Chocolate Layer Cake from scratch with a creamy Vanilla Frosting. Would be delicious with today’s frosting recipe too! 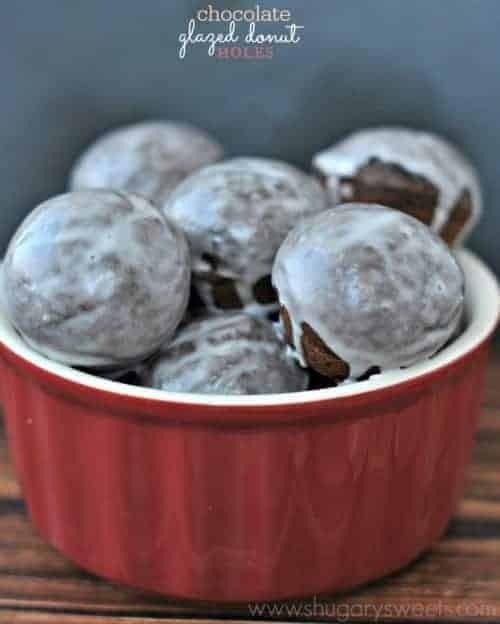 Chocolate is perfectly acceptable for breakfast with these Glazed Chocolate Donut Holes. 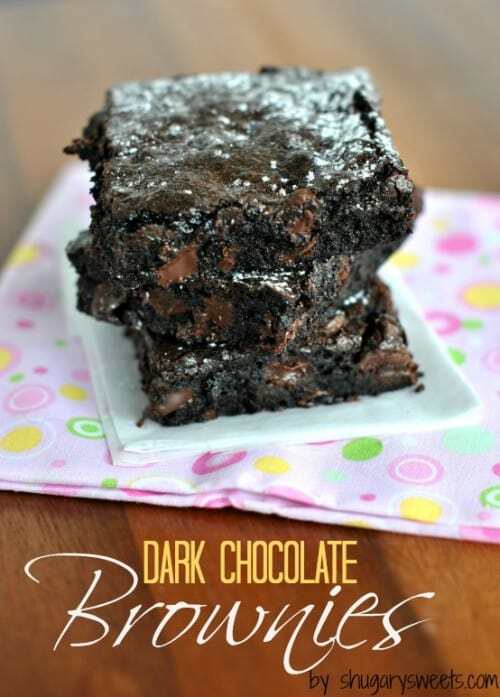 My favorite Dark Chocolate Brownies recipe. Perfect and from scratch! Just as easy as a box, honest! You forgot “EAT ME YOU FOOL!” 😉 You transformed this cake mix! 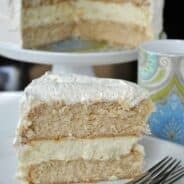 I am not the biggest fan of cake, but I love gooey bars. 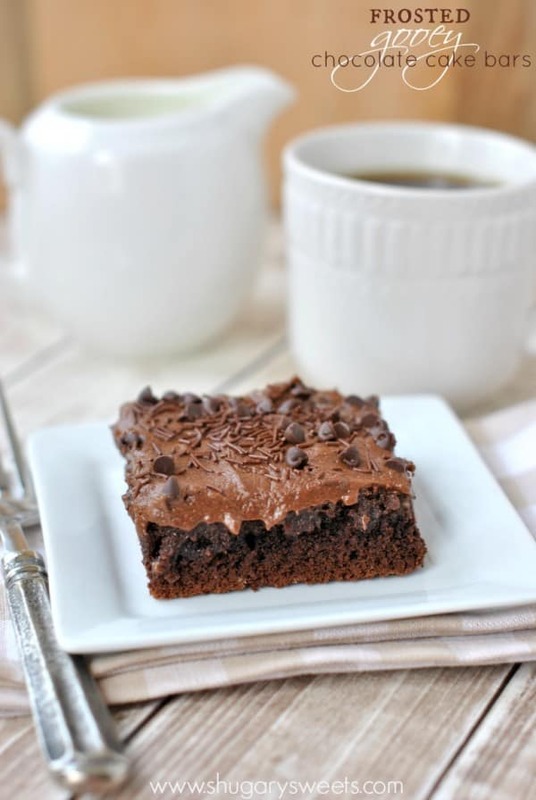 The double dose of chocolate makes these even better! Happy early Mother’s Day, Ms. Aimee! Ah yes, you’re correct. Thanks for the sweet Mother’s Day wishes!! Oh, the chocolate goodness!!! I think I hear all the chocolate in my kitchen yelling at me now too!!! 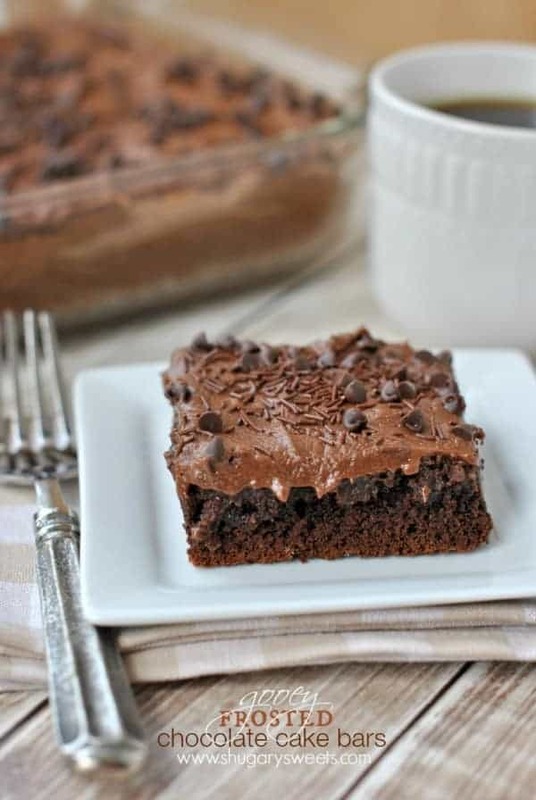 What I would give to have that gooey deliciousness appear magically in my kitchen!!! Wowza! Thanks girl, hope you had a great Mother’s Day!! Whaaaaattt!! These look so good! I love a good gooey butter cake. Imagining one with a chocolate twist and covered with frosting? Well damn. Yes, these are based off my favorite gooey butter cake. Why not make a chocolate version!! Oh my heck. These are fabulous!! Happy Mother’s Day my friend! Happy Mother’s Day to you too! Hope it was relaxing! Love doctoring cake mixes! This is a great idea. 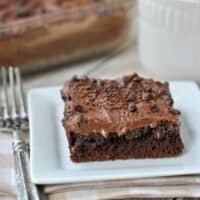 So chocolatey and fudgy! Nice call on the frosting!! These looks so good. My mom is a huge chocolate lover. She would eat this right up!! Aww, I think you need to make them for her!! This cake is oozing deliciousness. That frosting sounds amazing. And, cake soup… I need to make that happen. Pinned. These look rich and indulgent!! Why am I not your neighbor, these look freaking bomb diggity!! Oooh neighbors would be so fun!! Now I’m hearing voices saying Make me you fool!! LOL seriously where is the cake mix when you need it!! I made this last night and it was AMAZING! I forgot the vanilla in the cream cheese layer (oops! ), but it was still soooo delicious and rich! Thank you so much! I’ll never use canned icing again! These are amazing! Made them for a church youth event, and they disappeared in seconds!